Take an epic journey down the stunning California coast on this 3-day one-way trip from San Francisco to Los Angeles. In addition to traveling through the spectacular Big Sur region, you'll visit Santa Cruz, Monterey, Carmel, Pebble Beach, Cambria, Solvang and Santa Barbara, and enjoy views of jagged coastlines, mountains, forests and rolling hills studded with vineyards. 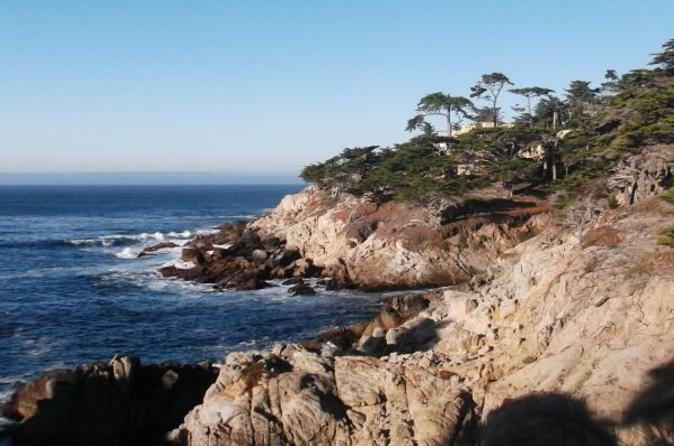 Explore fascinating marine exhibits at the Monterey Bay Aquarium, take a guided tour of magnificent Hearst Castle, journey along famous 17-Mile Drive, spot California's iconic sea lions, and take the train from Santa Barbara to downtown Los Angeles. This tour by comfortable van offers flexible daily itineraries, letting you explore at a relaxed pace with your knowledgeable guide and on your own. This tour is perfect for those looking to get from San Francisco to Los Angeles in a fun, relaxing and incredibly scenic way. This small-group tour is limited to 8 people, ensuring a more personalized experience. On your 3-day trip from San Francisco to Los Angeles, enjoy free time in each city you visit. Flexible daily itineraries let you explore at your own pace, and admission to the Monterey Bay Aquarium and a guided tour of Hearst Castle are included. Your guide will offer interesting and informative commentary throughout your trip about local history, culture and architecture. Choose between Comfort and Superior accommodation types.